Previously, we answered many of your questions about bringing bikes on Amtrak. Now, we'd like to share with you some more details about the specific equipment used for bike service on Amtrak trains. This article was originally published in the Summer 2017 issue of the League's Bicycle Friendly America magazine. More than 14,000 cyclists have ridden with their bikes in tow since fall 2016, and reservations this summer are booking fast. The best part is that no bike disassembly is required! 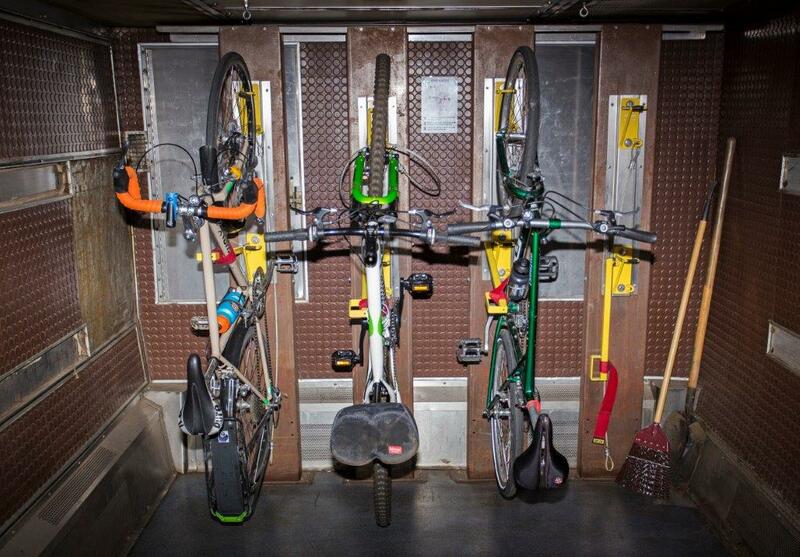 During the recent Bike League Annual Summit, Amtrak welcomed members of the bike community at Washington, DC’s Union Station, where the company showed off three types of equipment used for bike service. More than 50 participants from associations and advocacy groups sent delegates to test the equipment and ask questions about Amtrak bike service. 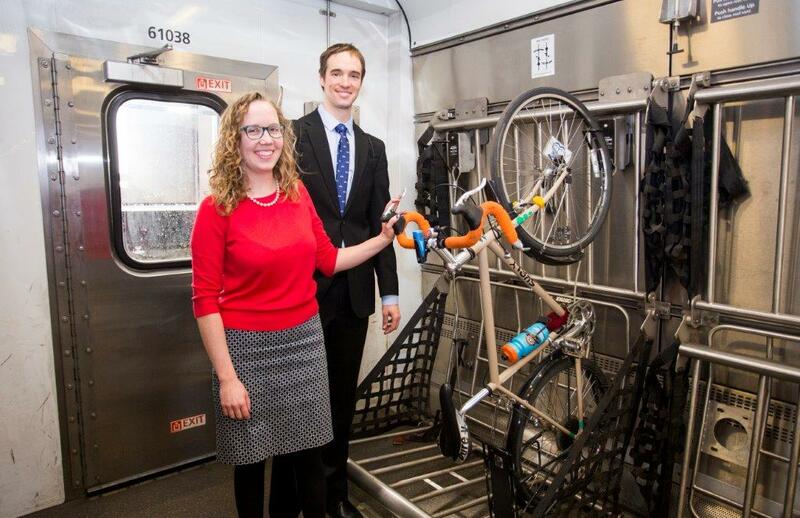 Amfleet I Car: In 2015, Amtrak began installing bike racks in 12 Amfleet I cars, which allow for the safe carriage of unboxed bikes. Passengers riding to and from a Green Mountain state destination on the Vermonter may reserve one of these spots for $10-$20 depending on the city. Current capacity on the Vermont service is 3 bikes. Viewliner II Baggage Car: These new baggage cars, found on all 15 long-distance routes, began entering service in 2015 after being assembled in Elmira, N.Y. Each car has room for 6 bikes, and each spot may be reserved for $20. Customers with a bike roll up to the door of the baggage car, where an Amtrak employee takes the bike and places it in the rack. The process is simply reversed at the customer’s destination so you can easily ride away from the station. Superliner Coach-Baggage Car: These cars are generally found west of the Mississippi, as their height prevents them from fitting through many tunnels in the East. The top level has spacious coach seating while the lower level has a baggage area with 8 bicycle spaces. Like the Viewliner II baggage car, their racks safely hold fully assembled bikes, and each spot can be reserved for $20. Customers roll their bikes to the car door and may load the bikes themselves. Future Amtrak bicycle plans are in the works, and Amtrak has committed to keeping the bike community up-to-date as things developed. “Bicycles are part of our nation’s transportation system, and we are proud of the work we have done to make travel on Amtrak with a bicycle more convenient. We’re looking forward to further enhancements as funding is identified,” said Mariah Morales of Amtrak’s Government Affairs. 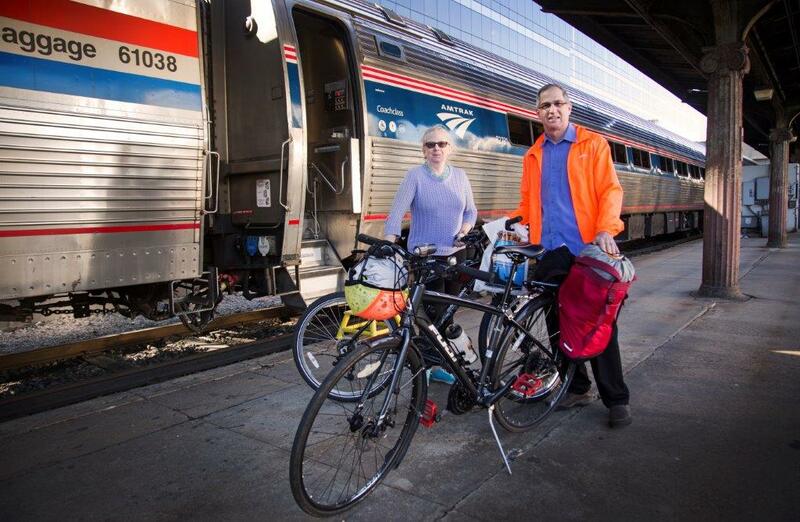 To learn more about bringing your bike on Amtrak, visit: https://www.amtrak.com/bring-your-bicycle-onboard. Our trip to Indianapolis from Denver with bikes was fantastic. The only way to travel. The ability to get a bike on Amtrak is a great thing. Last week I went to put my bike on train to DC from Baltimore and was told there was no baggage car so no bike. I was able to take the wheel off and squeeze it into a luggage space elsewhere. Also, a $20 fee each way from Baltimore to DC is a bit steep to pay. Would recommend somehow no or little fee for short routes. During my college years, I spent the summer of 1957 touring the Netherlands, Belgium, northern France, England, Scotland and N. Ireland by bicycle. Glad to know that America today is finally approaching the standards of bike/rail travel of Europe in 1957! I recall rail transport as easy, convenient, cheap and available. May it become so in the USA.